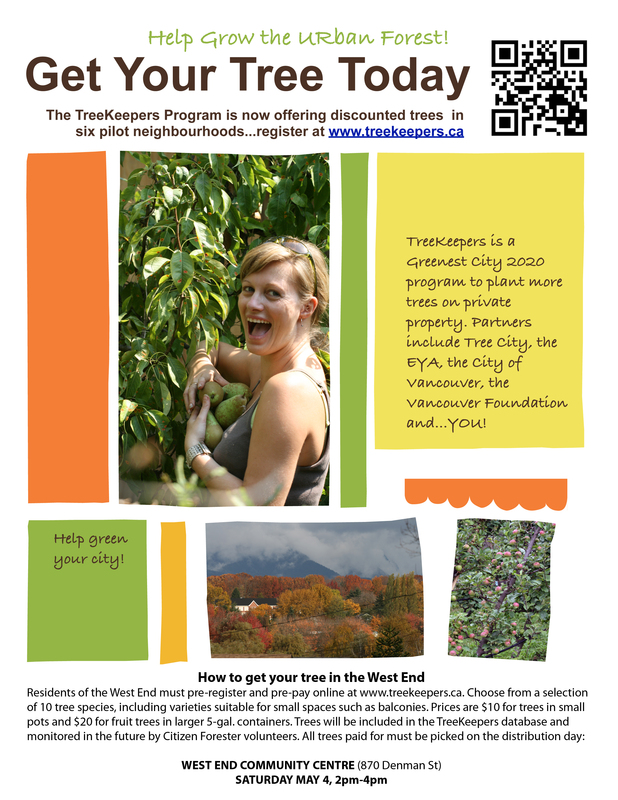 (April 11, 2013) Registration is now open for folks in the West End to get a great deal on trees through TreeKeepers (including varieties that will do well in a container on a balcony). All people need to do is go to www.treekeepers.ca and click on the “GET A TREE” button to see a pop-up of 10 tree selections. Trees must be paid for online via the paypal form that will come up, and they must be picked up on the distribution day for your area: Saturday, May 4, 2pm-4pm at the West End Community Centre. Are you interested in growing, consuming or recycling food in the West End? If so, this session may be of interest to you. The session will start out by exploring key information about the food system within the West End followed by an asset mapping exercise to collaboratively learn more about what assets exist within our community. A healthy food system is one in which food production, distribution, and consumption are integrated to enhance the environmental, economic, social, and nutritional health of a place. The West End is undergoing an official community planning process through 2013 that will guide development here for the next few decades. This is an opportunity to look at our urban community of 46,000 people through the lenses of food systems, food security, food access, food growing, food justice, etc. and provide input into a formal process of urban planning. Did you know that a network of Neighbourhood Food Networks exists in Vancouver? The West End Neighbourhood Food Network is hosting the bimonthly meeting on March 28. Anyone is invited to the casual meet-and-greet event. Find out what’s going on around the city and who’s involved. RSVP requested. This forum features masters student Liz Blakeway, reporting her research findings on food scraps/composting-related policy, and showing the potential for us to transform waste management in Vancouver and BC’s Lower Mainland. Other guest speakers may be announced. All food scraps will be banned from garbage and the Metro Vancouver landfill by 2015. Vancouver and other municipalities are scrambling to organize systems for collection and processing of food scraps. This forum will provide information and cover the significance and prospects for food scraps composting. As one model of how to handle food scraps, the Food Scraps Drop Spot at the West End Community Centre has been running since June 2012. In just over a year, four trial Drop Spots have collected over 30 tonnes of organic waste from over 8,000 individual drops. Food Scraps and Composting Forum, West End Community Centre, 11 am to 12:30 on June 16, Featured speaker Liz Blakeway presented findings to date on her masters research about how policy hinders or helps food and organic waste collection and composting at municipal, regional, and national levels of government in Canada and overseas. Local West End cases were introduced. A report will be posted online here soon. Liz says there is an opportunity to transform waste management in the Lower Mainland of BC. We can be part of that transformation. Purpose: To inspire and inform by providing information and covering the significance and prospects for food scraps composting. Click here to see slide show online. Car Free Day June 17, 2012 – WENFN had a table shared with Village Vancouver and the Drop Spot at the West End Car Free Day on Denman Street. We will continue discussions and list up all the elements in the West End relating to food growing and food security. We will look at what is missing and how things can be connected.